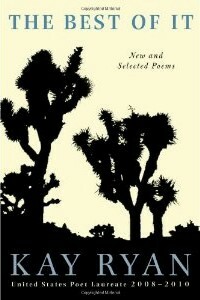 Earlier this year, Grove Press released The Best of It, a compact, gorgeously designed selection of poems by Kay Ryan, the California-born and -based writer who was the U.S. Poet Laureate from 2006 til 2008. She is one of my favorites, and I’m hardly the only person who feels this way: Ryan is one of the few American poets who actually moves enough units to make some kind of a living from verse (although since the 1970s her day job has been teaching literature at a community college in northern California). But popularity alone is hardly a reason to spend time with her. Luckily there are lots of other reasons. She draws a lot of comparisons to Emily Dickinson, which is only partly fitting. Like Dickinson, Ryan writes short poems (rarely more than one page) with abbreviated lines and a complicated mixture of internal and line-end rhymes. Her sense of music sets her above most contemporary U.S. poets: prosy free verse has become American poetry’s dominant format over the past fifty years, but Ryan’s style evokes an older lyric tradition. While her verse isn’t as regular as, say, Auden’s, it still clearly demonstrates the pleasurable contributions sound makes to sense (or “content,” if you like), and her ability to incorporate patterned acoustics into clipped lines is, like Dickinson’s, astonishing. Try writing a compact poem that rhymes and scans without sounding like a bouncy-bouncy nursery rhyme; it’s really, really hard. Her lines are usually a couple beats longer than this, actually, but “Divest” gives you a sense of how she works. Short enough to read during your lunch break or while you’re waiting for friends to show up at the bar, Ryan’s poems make you uneasy and happy at the same time. Like the poems of anyone who’s any good. Dig her.